OTTAWA, March 8, 2018 – It was a near-death experience for Canadian federalism. The 1995 Quebec referendum vote was so close, with only 50.6 per cent rejecting provincial sovereignty, it set in motion a chain of events which continue to impact Canada. But another legacy is the underlying role it had in bringing the Office of the Auditor General of Canada (OAG) on to the radar of many ordinary Canadians. 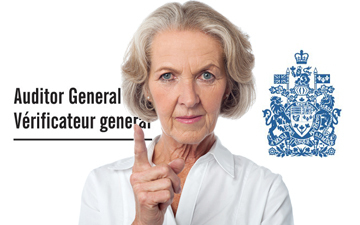 Auditor General Sheila Fraser reported to a shocked nation that hundreds of millions of dollars earmarked to promote federalism in Quebec in the wake of the razor-thin 1995 referendum had been haphazardly paid out. “Sheila Fraser’s tenure is, I think, in the modern era of the Auditor General’s office, certainly the big turning point. Suddenly the public is aware of who this person is in a very pronounced way,” says Emmett Macfarlane, an associate professor of political science at the University of Waterloo. Fraser’s explosive revelations led then Prime Minister Paul Martin to call a public inquiry, resulting in the appointment of the Gomery Commission, which also delivered a scathing indictment of the government’s conduct in two reports, delivered in November 2005 and February 2006, respectively. Many historians and political scientists point to the sponsorship scandal as a key factor in Martin’s subsequent defeat in February 2006 to Stephen Harper’s Conservatives, ending the Liberal Party’s 12 plus years in power. The Liberals had already been reduced to a minority in the June 2004 federal election following Fraser’s report on the scandal earlier that year. Fraser, whose ten year term as Auditor General ended in 2011, is still fondly remembered by many Canadians for her role in singling out financial misconduct with taxpayer dollars. But while the sponsorship scandal review is certainly one of the most memorable reports issued by the OAG, experts cite the federal Auditor General Act of 1977, containing key new modernization features, as the catalyst that would ultimately elevate the office’s status. Prior to that, “financial reporting in the public sector used to be dull because it just reported what was budgeted and what was spent,” noted Wally Smieliauskas, a professor of accounting at the University of Toronto’s Rotman School of Management. The 1977 Act expanded the Auditor General’s mandate to include value-for-money audits, also known as performance audits, on top of traditional responsibilities such as determining whether the government’s financial statements are complete and accurate and deserve a clean audit opinion, or whether that opinion needs to be qualified. Auditor generals in other Canadian jurisdictions are also guided by that expanded mandate. Under value-for-money auditing, “I think we’ve made government more transparent and accountable, and provided more information to our legislatures in each province,” says Bonnie Lysyk, the Auditor General of Ontario, who is also a former Provincial Auditor in Saskatchewan and Deputy Auditor General in Manitoba. Jeff Buckstein, CPA, CGA, is an Ottawa-based journalist. Next: The Activist Label.